A man has been jailed for at least 16 years for strangling his partner at their home. Michael Foster, 39, was handed the life sentence after being convicted of murdering 44-year-old Paula Harris on 29 January. 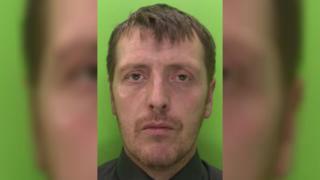 A jury unanimously found Foster, of St John's Place, Mansfield, guilty at Nottingham Crown Court on Friday. Police said the day after Foster killed Miss Harris, he told a neighbour when leaving the flat "she's still asleep". That same morning, Nottinghamshire Police said, Foster texted a former partner saying Miss Harris was dead and he was "going to go back and clean up, then move her and report her missing in a couple of days". Miss Harris's body was found when officers forced entry to her flat. Police said it was apparent Foster had fled from the scene in Miss Harris's Ford Fiesta, which was found locked and unattended in Mansfield Woodhouse on 30 January. After receiving information, officers found Foster at a nearby address and arrested him. Det Sgt Rob Wells said: "I hope this sentence and seeing justice served gives Miss Harris's family and friends some comfort as they continue to deal with their loss."